I am excited to announce that I was recently asked join the Netflix #Streamteam! I have been a fan of Netflix for years so to team up with them is pretty much a no brainer. My family and I stream Netflix for the majority of our TV shows. 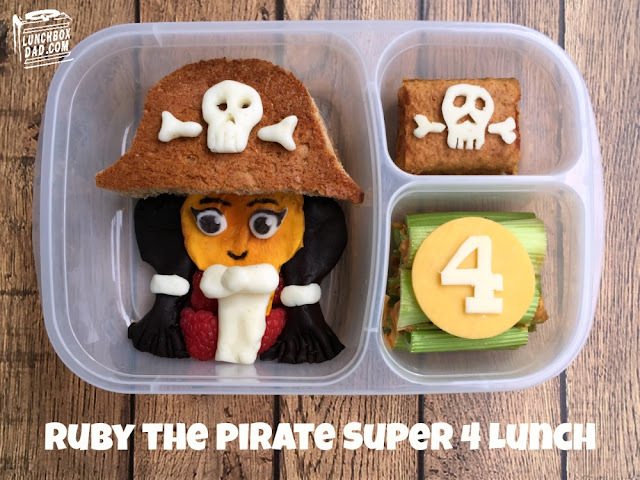 I would even say that I get most of my lunch ideas from what my kids watch on Netflix. Today's lunch is no exception. My kids were pumped to watch Super 4 on Netflix. It is a new show that debuted last month. It is based on the Playmobil toys from my childhood. Guess what they are still around today and my kids want them now. 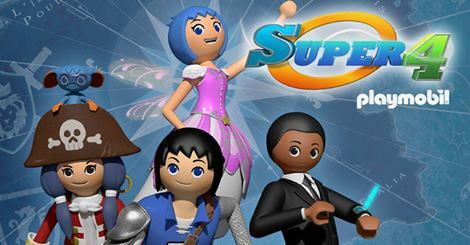 Super 4 consists of two 11 minute episodes per show. I like that the main characters are both girls and boys. My daughter immediately picked up on that and chose Ruby the Pirate as her favorite hero. I just had to make her a Ruby lunch before the end of the school year. From what I heard, she loved it and told all her friends about Super 4. The instructions for how to make the lunch are below. It was made in an Easy Lunch Boxes container. Make sure to follow me on social media and check out Super 4 on Netflix. Your kids will love it! 1. 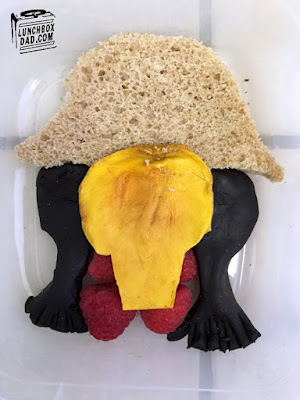 Cut two pieces of bread in the shape of a pirate hat. It is almost a half circle shape. Place one slice of bread in main compartment. 2. Form black modeling dough into two braid shapes. Place braids and raspberries where shown under the hat. 3. Cut mango into head and neck shape. Place on top of raspberries. Put meat and cheese on bread and another slice of bread on top to make a sandwich. 4. Form hair ties, eyes, and skull with white modeling dough. Place where shown on face and hat. Use black food coloring to make facial features. 5. Put fruit bars in side compartment. 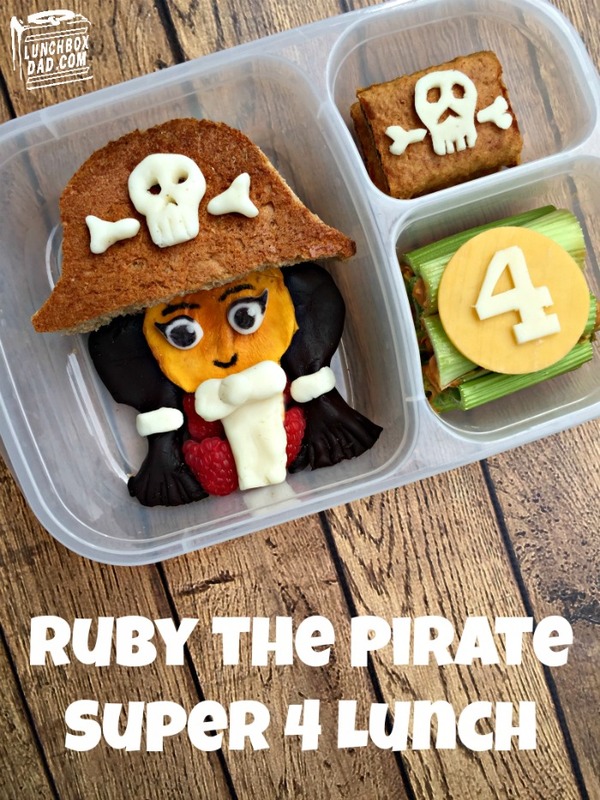 Cut white cheese in the shape of a skull and crossbones and place on top to make a pirate flag. 6. Use nut free spread on celery sticks. Place in side compartment. Cut cheddar cheese in the shape of a small circle. I used a small glass as a guide. Place on top of celery sticks. Cut white cheese in the shape of a "4." Place 4 on top of cheddar cheese.